Muddy Buddies are one of our family’s favorite Sunday night treats to make. The only problem for me is that once I start eating them, I have a REALLY hard time stopping. I also happen to love cake batter, just give me a spoon and let me have at the bowl . So obviously when I saw this recipe I knew I had to make them. So I made them, and the verdict is. 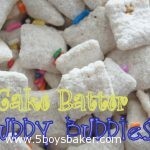 . . . . . .
Muddy Buddies + Cake Batter = YUMMINESS!!! These are addicting. I have now made them three times in the last two weeks and as I’m writing this post, I’m thinking I need to go make them when I’m done! Place Rice Chex in large bowl. Sift cake mix and powdered sugar together and set aside. Melt almond bark according to package directions. Pour melted almond bark over Rice Chex, carefully stirring and folding until Rice Chex are covered. Sprinkle cake mix/powdered sugar mixture over and carefully stir until cereal is covered. You can pour the cereal into a large ziploc bag with the cake mix/powdered sugar and then shake it until it's all coated, but I like to just keep it in the bowl and toss it until it's all covered . So excited to try these. I am making them this afternoon as a treat for my Activity Day girls. I am going to put a few handfuls into treat bags for a snack as we go on a field trip. I’ll let you know how they turn out! Also, have you ever doubled this recipe? I know my kids will want some too!! Jenny, I’m sure you can double them with no problem. I think you’d better or your kids will be mad if they don’t get any! OK, I made two batches, one right after the other because they were so easy! I didn’t disclose the “secret ingredient” to my Activity Day girls and they had a ball trying to guess because it was a familiar taste. One little girl finally figured it out because she said they tasted like cupcakes. They devoured the entire bag. I am sure I wrecked all of their dinners!! Thanks Jodi! !